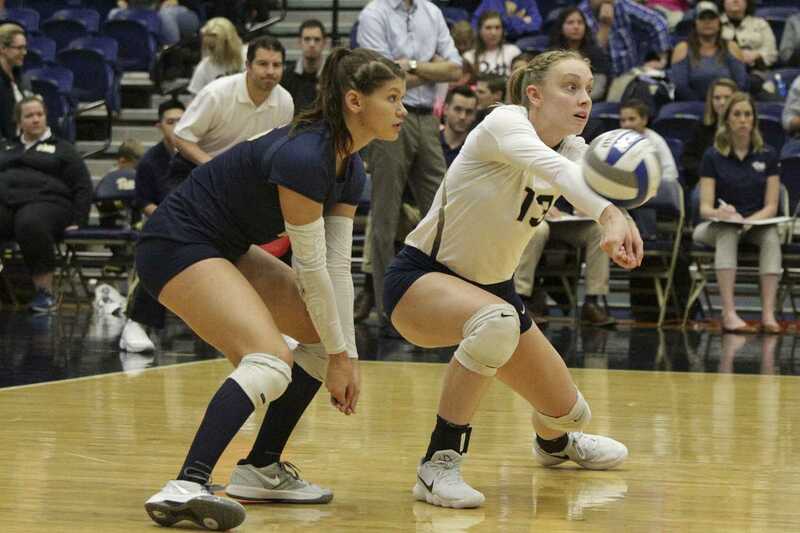 The Pitt volleyball team used not one, but two weekend wins to demonstrate why they belong at the top of ACC volleyball standings. The Panther volleyball team defeated Miami (15-5 overall, 9-5 ACC) and Florida State (12-10 overall, 6-8 ACC) at the Fitzgerald Field House to pull to 19-6 overall and 12-2 ACC record. The Panthers overcame a fast start from the Hurricanes to eventually cruise to a 3-1 match victory in a Friday night matchup against Miami. After a 4-4 tie to begin the match, the Hurricanes went on a run, winning six of the next seven points for a sizeable 10-5 lead. The Hurricanes maintained this lead throughout the set, and at 23-19, it seemed as though the set was over. But the Panthers rallied, winning three of the next four points to cut the deficit to one at 23-22. After the Hurricanes called a timeout, they returned to the floor and scored on the next two points on a kill and a Panthers’ error to take the set 25-22. Pitt responded to the first set by dominating the next one. The Panthers jumped out to an early 4-0 lead — and it only ballooned from there. Leading by as much as 12 points, the Panthers cruised to an easy 25-16 second set win to tie the match 1-1. “I was pleased that we clicked in, and I think our offense was pretty good too,” head coach Dan Fisher said. Keeping up the intensity in the following set, the Panthers grabbed another big lead at 8-2. Once the gap extended to nine at 16-7, the Panthers demonstrated their depth. Winning seven of the next eight points, four different Panthers hit kills during this stretch, and Williams capped off the run with a service ace to give the Panthers a 23-9 lead. The Panthers eventually finished the set 25-11 to take a 2-1 match lead. Maintaining the energy, the Panthers began the fourth set and quickly grabbed a 9-4 lead. But after some strong offensive play from the Hurricanes and a few Panther errors, the Hurricanes eliminated the deficit and tied the game at 14. From there, the Panthers gained a slight edge on the Hurricanes, but a Panther service error cut their lead to two at 21-19. The Panthers rallied and won four of the next five points to win the match 3-1. Williams, sophomore Nika Markovic and first-year Kayla Lund made major contributions to the Panther offense, each hitting more than 10 kills and above a .300 hitting percentage. Returning to Fitzgerald Field House for a Sunday matinee, the Panthers defeated Florida State 3-0 in a tough match. The two teams played each other evenly to start the set, and after a 12-12 tie, the Panthers ripped off three straight points to take a 15-12 edge. Holding onto this lead the rest of the set, the Panthers closed in on a 24-22 lead with a chance to win the set. On the next point, first-year Chinaza Ndee slammed a kill to win the set 25-22 and put the Panthers up 1-0. Strong defensive play at the net from from both sides didn’t allow many easy points, but the Panther offense managed to hit 14 kills compared to 10 for the Seminoles. “Florida State is a really good blocking team, so Kama [Kamalani Akeo] and I just kept talking about killing them with speed,” Williams said. Surviving early self-inflicted errors, the Panthers managed to remain even with the Seminoles as the two teams reached a 9-9 tie in the second set. Finding some offensive rhythm, the Panthers won seven of the next nine points to take a 16-11 lead. The Seminoles worked their way back into the match — partially on the back of a few close calls in their favor — and tied the Panthers at 20. Responding with five straight points on the back of three of Williams’ kills, the Panthers won the second set 25-20 for a 2-0 match lead. The Panthers jumped out to a 10-5 lead early in the third set. The two teams traded blows until the Panthers held a 23-18 lead. Scoring on a Markovic kill and an attack error from the Seminoles, the Panthers won the next two points to take the third set 25-18 and the match 3-0. The Panthers will be back in action next Friday at the Fitzgerald Field House in a 7 p.m. matchup against the Wake Forest Demon Deacons.